The pins are for '88-'93 Dodge Cummins or any engine with a Bosch VE injection pump. 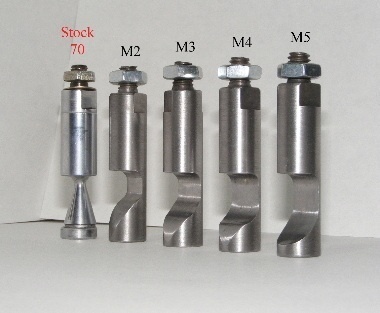 All pins have been hardened for long life. Stock drivability with more top end fuel than stock. Would work great for towing and at high altitude. Works great with a manual transmission. Smoke is very controllable this makes it work well for day-to-day towing / driving. When the work is done just go play. Medium fast pin allows slightly more mid range fuel than the M2 pin. Fast fuel pin allows maximum fuel nearly right away. Very fast fueling pin. Allows full fuel right away. We call it the play pin. Currently out of stock of some items. It is just a heads up to all Diesel Heads to visit our friends at Diesel Bombers.